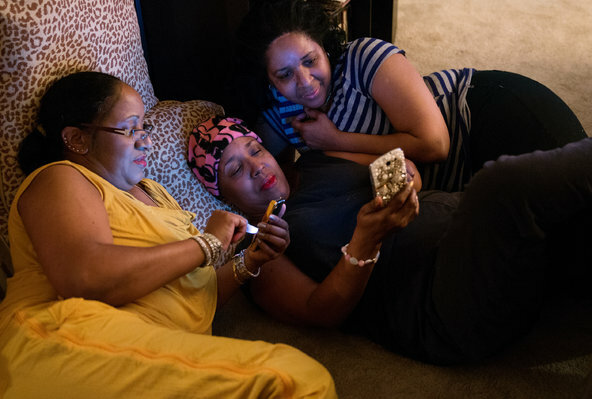 Debrah Reid, 59, center, in 2013, relaxed with her sister, Audrey Anderson, left, and friend Travia Davis, at her home in Memphis. Ms. Reid was given a breast cancer diagnosis in 2013 and was featured in an article on racial disparities in breast cancer that year. Ms. Reid died in May 2015 from the disease. The finding is worrisome because breast cancer has historically been more deadly in black women than in white women, but at least it has not been as common. Now, as incidence rates equalize, the data suggest that breast cancer will continue to exact a far greater toll on black women, and that the trend shows no sign of abating. The data were obtained from the Surveillance, Epidemiology, and End Results (SEER) program of the National Cancer Institute, a program that has been collecting information on cancer patients since 1973. Among white women breast cancer incidence rates have been stable since 2004, hovering around 135 per 100,000 women. But among black women, rates have been consistently lower, ranging from 119 to 125 per 100,000. But in 2012, a startling change occurred. The incidence rate moved to 135 cases per 100,000 women for both white and black women. While it’s possible that a fraction of the rise could be attributed to earlier detection, that would not fully explain the trend because rates at which women are being screened for breast cancer have remained stable. As a result, the trends suggest that the uptick in incidence is not a result of doctors simply finding more cases of breast cancer, but is probably the result of other factors. Researchers say the reasons behind the increase are likely to be complex, but rising obesity rates among African-American women may explain some of it. Obesity has been linked to an increased risk of estrogen-receptor positive breast cancers, and much of the increase in breast cancers among black women has been due largely to more cases of this type of tumor. The obesity rate in black women was 58 percent during the 2009 to 2012 period, up from 39 percent from 1999 to 2002. Meanwhile, the obesity rate among white women has stabilized at around 33 percent. Researchers also believe that changes in reproductive patterns may play a role, as more African-American women delay childbirth and have fewer children. Both are recognized risk factors for breast cancer. Over all, the report painted a grim picture of the state of breast cancer in African-American women, showing that advances in diagnosis and treatment that have dramatically improved survival rates from breast cancer and saved countless lives have largely bypassed African-American women. By virtually every measure of the disease — age of diagnosis, age of death, stage of diagnosis — black women are at a significant disadvantage compared with white women, the data show. Black women are given breast cancer diagnoses at younger ages and die from the disease at younger ages than white women, suggesting that the disease may exact a greater economic and family toll on the black community by stealing more of a woman’s most productive years. The median age at diagnosis is 58 for black women and 62 for white women. The median age for breast cancer death is 62 for black women and 68 for white women. Black women also are less likely than white women are to be given a diagnosis of early stage disease, and more likely to be given a diagnosis with later stage, and less treatable, tumors, according to the report. Black women also lag behind white women in diagnosis of estrogen-receptor positive disease, the most treatable form of breast cancer. Among white women, 76 percent of cancers diagnosed are ER positive, compared with 62 percent in black women. Over all, a black woman given a breast cancer diagnosis is 42 percent more likely to die from the disease than a white woman with breast cancer. An analysis of breast cancer mortality trends in 41 of the largest cities in the United States, published last year in Cancer Epidemiology, found that in some cities the risk is even greater. In Los Angeles, a black woman with breast cancer is about 70 percent more likely to die from the disease than a white woman is. In Memphis, black women face more than double the risk. Researchers say the racial divide in breast cancer mortality may be due to a combination of factors, including disparities in the quality of care available to black women, who may have less access to quality screening and treatment, compared to white women. Lower rates of follow-up after a mammogram, cultural distrust of doctors, and lack of insurance coverage among black women may also play a role. Dr. Moysich said she hopes the data will galvanize the African-American community and the medical community in general to push for more research. Mary Singleton, 57, learned in July that she had Stage 4 breast cancer. After the diagnosis her son, George, moved home to Memphis to help take care of her and to help run her printing business. By Stephen Maing on Publish Date December 20, 2013. Later in the sequence of my experiences with cancer you will note that I introduce some results and events most probably linked with cancer such as enlarged & damaged Prostate and a consequential Heart Attack leaving me with no right coronary artery! I have also included numerous articles and anecdotes regarding health – primarily related to cancer, prostate and heart conditions – FYI! This entry was posted in Breast cancer and tagged Black Women, Breast cancer, Ethnic Cancer Risk, GL-W, Greg Lance-Watkins, Greg_L-W, New York Times. Bookmark the permalink.